Well just for the heck of it I decided to use my long line ammo to shoot the short line at a local match. I am a believer in using lighter loads for the short line, so this goes against my beliefs based on experience. I did it for two reasons, my press was set for 4.2 gr of BE and I didn't want to change it because I'm doing some testing, and then because I figured I would refresh my memory with practical hands on experience of why I believe in lighter loads for the short line. Ok, 99% of us shooters are civilians and do not shoot everyday. We have limited time and resources. Obviously we are all in a different boat, but I think this is the norm. 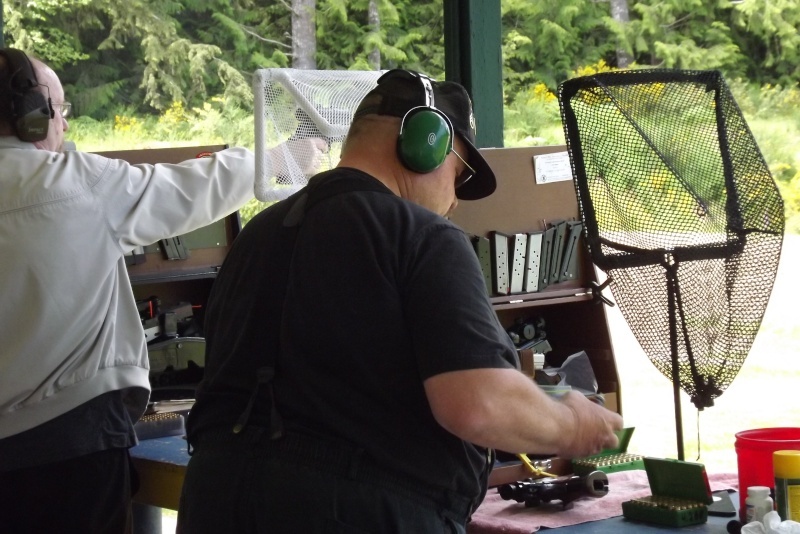 The military teams shoot daily and are generally more fit and conditioned for shooting a 2700. They can shoot hotter ammunition consistently better from the continuous training. The 2700 match is an endurance event, us civilians have our work cut out for us!!! When shooting long line we need to push the bullet faster for good accuracy at 50 yards. When we shoot long line we can grip hard/firm and then slightly relax hand between shots; we have 10 minutes. Not a big deal dealing with the extra recoil of the 50 yard load. Short line we now have issue of turning targets, holding breath for longer period of time and recoil recovery for next shot. When shooting hotter loads we have a tendency to over grip and this affects trigger control. I believe our fine motor skills slightly decrease and trigger control diminishes. The result now is either early shots (shot breaks during recovery) which are high ( 8 or 9 ring at 12:00) because you haven't made it back into the 10 ring yet, or poor breaking shots; jerk, flinch, due to loss of fine trigger feel. Also we work harder to recover which fatigues us including tiring of the grip and forearm. I also noticed breathing becomes an issue which affects eyes and muscles. I was using Magnus 200 gr LSWC with 4.2 gr BE and 0.466" crimp. My long groups were tightly clustered and I was very pleased with my performance and results from the awesome load/ammo combination. I had groups of 7 shots knotted tightly together with the other shots called out. So everything was point of aim = point of impact. I would use this ammunition for Perry in a heart beat! Short line I can typically hammer out nice tight clusters using my softer loads; typically 3.4 gr BE with Magnus 200 gr LSWC. My results at 25 yards for the short line were nothing to write home about. I found myself breaking shots early and the good shots were sometimes high because I slightly relaxed grip from fatigue. I had very few targets with clustered groups. I think my best X count had 6 X's. I failed to clean a single target. I ended up dropping 15 points on the short line. I felt like the shots were breaking good (high ones broke good, just high; not in 10 ring yet when breaking) but the results on paper were not coinciding with what I felt as shooting them. I normally drop around 4-5 points and have excellent clustered groups. So I reinforced that short line ammunition should be lighter; better recovery, more forgiving, less fatiguing....win, win situation. So for those of you still shooting hotter loads at the short line I challenge you to give a softer recoiling load an honest try. I believe you will see a huge difference in your scores. Jon, great thoughts and writeup. But I have never owned a wadgun with a slide mounted dot that would function reliably with less than 4.0 of Bullseye. I've tried and tried, but the alibis kept coming. Maybe I'm too soft a holder. So I am missing out. Excellent... I have always said, recoil equals = lost points.. and I believe once the hype over slide mount peaks and declines, the advantage of the frame mount will be realized. David Sams always told me to get rid of the slide mounts.. I was a slow learner too, but he is 100% correct.. When I started BE in the late 1960s, there were no dots .. The Bo Mar steel rib was king.. Nearly everyone had one.. 4.gr of bullseye at long line and 3.5 at short line was universal with cast lead. I just weighed an old steel Bo Mar that I have and it is 6.32 oz.. A one inch Ultra Dot on a Marvel rib is almost identical in weight.. You should be able to get under 4 gr. with some tuning..
We are shooting 3 gr. BE, at short line with a frame mount. Jon, I think you just need to change the way you train. Add more pizza, big macs and late night sundaes to your training. At 5'8" and 315 lbs I find very little difference between my long line and short line loads. Thinking back on it I guess I have been in training my whole life to shoot sustained fire. That's my story and I'm sticking to it. What weight recoil spring are you using for 3.0 load? Do you use a heavier recoil spring for 50 yd load? Powder charge for 50? My Curtis Wadgun will consistently feed 3.7 of BE and a 185 cast bullet with no issues. It has a slide mounted ultra dot with what looks to be a Marvel rail. It does this with a 12lb spring as measured on a spring tester. I've tried 3.6 but never 3.5. Jon, what spring and dot combination are you running with your test gun, if you don't mind me asking? By the way, having shot next to the shooter using the 3.0 of BE, it has no problem ejecting with enough force to land on my non shooting hand in my pocket 6 feet away. Caspian 6" .45 Longslide I built myself. Typically use 12# standard length government spring for my 3.4 to 3.8 BE loads. I've used Ultradot 30mm scope in the past and now use a Aimpoint Micro. I made a small scope mount base on the rear of the slide (did not use full scope mount rib) with double rings cantilevering the Ultradot forward. Use the same base for Aimpoint. My pistol locks up snugly in battery (good upper lug fit, minimal hood clearances, and excellent 0.080" slidestop bearing surface. The properly fit barrel really makes a difference in reducing felt recoil from slide velocity. I used 15# recoil spring for the 4.2 gr BE loads I mentioned earlier. 14 lbs...I am not a spring poundage watch dog..What ever works... I kept going up in weight until she was happy with the recovery in rapid fire..Too heavy, and the muzzle will dip during recovery..and that requires an additional movement to get things lined up. . The slide can assist pulling the gun back on target.. The ISPC shooters have been doing this for decades..
Jon Eulette wrote: Caspian 6" .45 Longslide I built myself. Typically use 12# standard length government spring for my 3.4 to 3.8 BE loads. I've used Ultradot 30mm scope in the past and now use a Aimpoint Micro. I made a small scope mount base on the rear of the slide (did not use full scope mount rib) with double rings cantilevering the Ultradot forward. Use the same base for Aimpoint. My pistol locks up snugly in battery (good upper lug fit, minimal hood clearances, and excellent 0.080" slidestop bearing surface. The properly fit barrel really makes a difference in reducing felt recoil from slide velocity. I used 15# recoil spring for the 4.2 gr BE loads I mentioned earlier. Do you use a lighter weight hammer spring as well? My current wadgun was built by Clark for me in 1983. Colt weldup barrel and came with a Bomar rib with tuner. Even with the rib it wanted 4.0 in the summer and I had to go to 4.3 in the colder months. I still have the same barrel and the tuner on it under a slide mount and an ultradot with a 10# spring. It still groups 2" and I've had no reason to replace it. But I would love to get the load down without losing points to alibis. What do you recommend I try in the way of tuning? Loosen the tuner a bit? Reduce the magazine spring tension? Marvel disconnector cut? I'm not sure where to go with this. I'm just amazed that Jon gets good function from a longslide at 3.8 with a dot on it. There is some magic here I am missing out on. Also, I have no objection to the nifty custom frame mounts I've seen you use, but I have tried grip mounts in the past and that is a no-go for me. Most of the Clark's I encounter are loose and will shoot the softer loads. 99% of the Clark pistols come out of battery really fast and too soon because of the welded up barrel with the tuner and minimal upper lug engagement, so being too tight isn't an issue. I know several shooters out here in Kalifornia that use the Clark's with true softball loads. I don't know what I'd recommend. Hard to say without looking at the pistol. I'm impressed it's holding 2" with a 10# spring. I ran 5 strings of 3.5 through it this afternoon. No hitches and it locked back on every magazine. With 3.8 it seems to be throwing brass about where it used to with 4.3. I plan to try 3.5 for an extended period and see what happens. Also try a firing pin stop with a radius as large as possible, highly polished to a mirror finish.. Under cut the hammer, moving the fulcrum point up as close to the firing pin as possible/practical..also highly polished.. Polish your stripper rail, and use magazine springs that are not truck rated..I remove the bluing from the slide and frame rails.. Bluing is an oxide and does not contribute to lubricity.